The front of the male’s head is blue striped with a broad black bar. The top of the head is largely black except for two small pale postocular spots. The pronotum is largely black with patches of blue. The middorsal carina is nearly always black bordered by a wide middorsal stripe half the width of the mesepisterna. The antehumeral stripe is blue and no more than half the width of the middorsal stripe. The dark humeral stripe widens anteriorly and generally is only 2/3 as wide as the antehumeral stripe at that point. The rest of the thorax is pale to bright blue fading ventrally. The legs are pale with broad black stripes on their outer surfaces, but the distal portio ns of the tibiae and all the tarsi lack black stripes. The abdomen is bright blue dorsally marked with black, becoming pale ventrolaterally. Segment 1 is entirely blue except for the basal 1/3 to 1/2 which is black dorsally. A large, irregular black spot occupies the apical half of segment 2 dorsally and is confluent with an apical ring. A similar spot on segments 3-5 extends dorsally for as much as half the length of the segment. There is a dorsal stripe that extend 1/2 to 3/4 or more the length of segments 6-7. Segments 8-9 are entirely blue and segment 10 is black dorsally. The cerci are uniformly black with a pale distal tubercle extending beyond the lower arm of the appendage but that is clearly encompassed by the upper arm when viewed laterally. The cerci are approximately 3/4 the length of segment 10. The paraprocts are pale with dark tips that curve slightly upward. 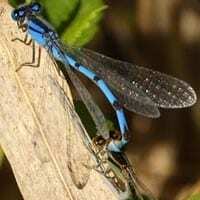 Females may be either blue or tan. The head and thorax are similarly marked to the male. The middorsal carina may have a full-length hairline stripe. The legs are like those of the male. The middorsal lobe of the pronotum lacks any distinct pits. The mesostigmal plates are divergent anteriorly with the anterolateral corners elevated. The abdomen is generally marked with more black than in the male. Segment 1 is almost entirely black dorsally with pale apical rings. There is a broad full-length black stripe dorsally on segment 2. Segments 3-6 each have a hastate black stripe running their entire length, or nearly so. Segment 7 is generally all black dorsally with only a pale apical and sometimes basal ring. A full-length black stripe runs from segments 8-10 dorsally. This stripe is occasionally constricted basally on segment 8 and apically on segments 9-10.